A Chocolate Fondue is such a leisurely way to end a meal. I enjoy how you take your favorite fruits, or maybe you prefer a sweet vanilla flavored marshmallow, or even a small chunk of vanilla or chocolate cake or a crunchy cookie and slide it onto a skewer. And then, ever so gently, you dip it into a pot of warm chocolate sauce. Doesn't that sound divine? Did you know that the chocolate fondue was invented by Konrad Egli of the Chalet Swiss Restaurant in New York. He came up with the idea in the early 1960s as a way to get people to buy dessert. But the fondue actually started out as a savory dish. John Mariani in his "Dictionary of American Food and Drink" tells us it's of Swiss origin and was first made with melted Gruyere or Emmenthaler cheese and white wine. The word "fondue" comes from the French verb "fondre" meaning "to melt", which explains why this dish was so named. Of course, the main focus of a Chocolate Fondue is the chocolate sauce. This rich and creamy sauce is made with semisweet or bittersweet chocolate, cream, a little sugar, butter, pure vanilla extract, and maybe some Nutella and/or your favorite liqueur. Try to use a good quality semi sweet or even bittersweet chocolate that you enjoy eating out of hand. Now, while a small fondue pot looks lovely, it isn't necessary. You can just heat the sauce beforehand in a small saucepan and then transfer it to a pretty bowl. When the sauce cools and thickens you can simply reheat it as necessary. There are just so many sweet things you can dip into the chocolate sauce. For the fruit you could use stemmed cherries, strawberries, pieces of cantaloupe, figs, honeydew, kiwi, pineapple, bananas, pears, oranges, raspberries, blackberries, and even slices of apple. Chunks of pound cake, butter cake, angel food, or sponge cake are lovely when smothered in a warm chocolate sauce. It is also nice to have some cookies available - like shortbreads, amaretti, ladyfingers, rolled wafer cookies, and even chunks of biscotti. While you can use special metal skewers for dipping, you could also use small forks or even bamboo skewers. Chocolate Fondue: Place the chocolate in a medium sized heatproof bowl and set aside. Combine the cream, milk, sugar, and butter in a saucepan and place over medium heat. Bring just to a simmer, stirring often. Remove from heat and pour immediately over the chocolate. Let stand until the chocolate has melted, then stir gently until smooth. Whisk in vanilla extract and the liqueur (if using). 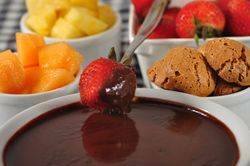 Place the chocolate sauce in a fondue pot or bowl and serve with fresh fruit, marshmallows, cake and/or cookies. If you're using a bowl, instead of a fondue pot, reheat the sauce if it becomes too thick. Makes about 1 1/2 cups (360 ml). Preparation time 15 minutes.